Netflix has been getting their hands in the anime licensing rights game in 2017 similarly to the likes of Amazon and their dedicated streaming service, Anime Strike. Seeing as this year has brought a lot of arguments over the impact that competition for legal rights to anime brings to the industry, plenty of people had pessimistic outlooks for Netflix throwing their name into the hat for several series. As it turns out, they showed that episodes will be released from entire seasons at a time (similar to how they release their dramas and other hit series). It certainly wasn’t the week to week format that fans were hoping for, but it was admittedly better to see that Netflix would not charge an additional fee for these series to be viewed on top of their service fee like what Amazon’s Anime Strike does. Most importantly for yours truly, it is really nice to see that Netflix is actually going through the whole process to get experts on board to handle the English dubbing of their various licensed shows. Last week, Netflix released the first twelve episodes in the newest addition to the Fate franchise, Fate/Apocrypha. Naturally, I was fascinated to see how casting went for my favorite melodrama with actual legends mixed in for loose plot. Probably one of the biggest factors that can be picked up on by this series is just how many more characters there are to fill from the usual Fate series. The “Holy Grail War” typically has seven participants and their teams being composed of “heroic spirits” and their “masters”. This leaves the usual character list at around fourteen or fifteen depending on the situation, however things are much different here. The rules of this war have changed, pitting two respective teams (Red and Black) up against one another. From the spirits alone the cast listing is up to fourteen. Given how the story is set up, almost all of the “masters” for one of these teams never actually show up nor do they have any lines. After all is said and done, however, there are still another seven or eight additional people to be added to the normal roll call between who is actually present for Red and all of team Black. Spearheaded by Erica Mendez in her first solo adaptation, this series is rich with young voice talent. I was thoroughly impressed with just how unique the cast list looked for this project. Unfortunately, things usually look the same for year to year dubs (ie you’ll get the same four or five leads for 2015, then the same situation for 2016 and so on), but this show had a bunch of names I had never heard before. I actually got to do a lot of research and listen to the works of the newer voice talents here! Major kudos for the talent scouting- it pays off. It has been a really good year for Harlacher- most notably her breakthrough into the average fan’s mind as a household name with taking on the role as one of the first main characters to be introduced in the Spring’s hit JRPG Persona 5. Her character, Ann Takamaki, has been the source of quite a bit of banter between fans, however the same could be said about anyone (and anything) related to the fanbase of the game. Regardless of the opinion an individual might have about the character, the actor positioned herself perfectly with being a character heard frequently in a 80-120 hour adventure. Before then, the anime dubbing artisan’s biggest title she was involved in was debatably Toradora! (or Hunter x Hunter if that’s your thing), so the attention is a big plus even if it comes at the cost of a rather toxic fanbase. As for the actual show at hand, Harlacher plays a very different lead character compared to the usual lead in a Fate series. There certainly is a lot less of the long winded monologues here (that’s for everyone involved in general, but it is most evident in Ruler) and in exchange the audience gets a lot more smaller, authentic moments and interactions between characters. Albeit brief, the legendary end to Jeanne d’Arc’s life is shown in a very emotionally charged scene. Working in favor of Harlacher, Jeanne d’Arc is one of the most well known figures in all of history and (compared to a lot of Fate characters) she is a very real individual. I recall being read the tale of an illiterate farm girl leading a rebellion against a significantly more powerful country before I went to bed and the inspiration the Maiden of Orléans brought. Harlacher does not disappoint in giving a voice to such a hero- her line deliveries feel thoughtful and noble without dropping back into the melodramatic sounds the Fate series occasionally finds itself. Of course, the big payoff moment for this first cour Netflix released was when the audience finally got to see and hear Jeanne’s Noble Phantasm (her special move)- Luminosité Eternelle. Nothing better embodies the ethos and impact the martyr had on history than something that protects and furthermore saves lives at the cost of her own body. Harlacher delivers the emotional intensity of the scene perfectly- everything from her spoken French to the audible struggle to hold endurance through taking on the blunt of destructive force. Speaking of voice actors finding recent success, the young Zach Aguilar has positioned himself right in the middle of this Holy Grail War (both figuratively and literally in a character sense) at possibly the best time for his early budding resume. With leads from Aldnoah.Zero and One Punch Man already setting Aguilar as a standout, being a main character in a crowded cast like this will make an impactful boost to his career. As for the role itself, Sieg actually doesn’t have any lines until about a fourth through the first twelve episodes available right now. Sieg slowly builds his own will and desires for life as the battles wage on, reflecting upon every aspect of what makes him an independent being. This setup feels destined for failure, but the writing does a surprisingly good job not sounding edgy or pointless. Once things get rolling, Sieg has some big moments that Aguilar delivers well on. One in particular has Sieg taking on his personification of his “call to arms” mixed in with super dramatic music. The writing itself doesn’t blow you away, but it is self aware enough to give a couple satisfying moments without risking making the character of Sieg unbearable. This is really important because no matter how much good I highlight about characters in my Dubs w/ Dil articles, there are entire dubs I scrap due to one or two voice actors overacting in scenes. You keep waiting for it to happen in a Fate series, but actors like Aguilar prove that they can show up and make things respectable. Here is the real winner of the dub. There are a couple of technical factors that lead into what makes Lindbeck’s performance as Mordred so memorable. Unfortunately, I do not own the rights nor the means to clip out the audio for comparisons here, so I will do my best to explain it via text. Mordred is one of the first big anime appearances of what many familiar with the Fate franchise like to refer to as “Saber clones”. 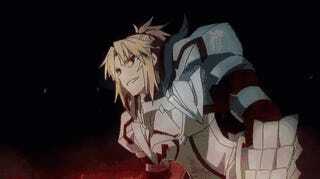 The cash cow of the series is undoubtedly Fate/Zero and Fate/stay night’s Saber, King Arthur. As a result, nearly every iteration of the series has a character that almost identically resembles this Saber with a few cosmetic changes or cultural influences in the design. The character of Mordred, however, makes sense to resemble King Arthur- depending on the lore you’re reading, Mordred ranges from being the King of Knight’s nephew all the way to being his illegitimate son. In Fate lore, Mordred is birthed as a result of magic and carries the same genetics as King Arthur. So where does Lindbeck fit into all of this? Well, the dubs of the Fate series have had several voice actresses play Saber, that much is correct. The most well known actress, however, was by far the one who took the role for Fate/Zero and Fate/stay night: Unlimited Blade Works in Kari Wahlgren. Naturally, I was surprised that rather than have her come back to voice King Arthur for the brief cameo she makes, they actually went with Michelle Ruff. What really impressed me, however? Lindbeck sounds so much like Wahlgren whilst voicing Mordred that it made me double take to make sure it wasn’t actually Wahlgren doing the voice. I think something lacking from voice acting that might even be absent in a lot of film is that sons/daughters should sound/look like their parent characters. Be it illegitimate child or whatever you want to call her, it is one insanely effective move to make Mordred sound similar to the King of Knights. That aside, Mordred is just a very fun character, and Lindbeck brings out all of the energy in her. Kind of like how Jamieson Price was as Rider in Fate/Zero, Lindbeck makes her character the most entertaining from both fights and normal interactions between characters. In many regards she can be viewed as an antagonist depending on the viewer’s stance on the term, but these moments make the character incredibly endearing. This is the most entertaining “antagonist” I’ve heard in a dub in quite some time, which a merit of its own. Hard to say how the second half will play out in terms of adventures for Saber of Red, but Linbeck will certainly make an impact on the scene! Just as the most natural progression for speaking about the cast, Saber of Red’s “master” Sisigou is a great place to continue. Voiced by the legend himself Patrick Seitz, this necromancer is quickly introduced as one of the focal points of this series. On a secret contract from the Mage’s Association, Sisigou involves himself with the Great Holy Grail War for a lofty cost. The man is a very pragmatic individual and definitely doesn’t step out of bounds from his work. 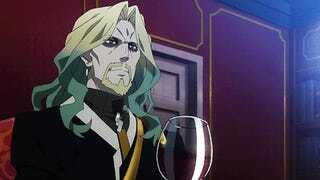 Such a role is perfect for the smooth voiced ace that is Seitz. A big appeal Matthew Mercer gave as Emiya in Fate/Zero was just how satisfying it was to hear him have a back and forth establishing lore for the series. Seitz gets his turn with the first few episodes here, even if we don’t see much of him later until just before the first half’s climax. Consider that the series has twenty or so characters to peek into, and Seitz’s role is above average in lines accompanied by a performance that is anything but. Ohhh~ Astolfo. I mean no disrespect by bringing it up, but as long as Astolfo will be brought up across social media platforms, there is a good chance someone mistakenly calls the Twelfth Paladin of Charlemagne a “very cute anime girl”. 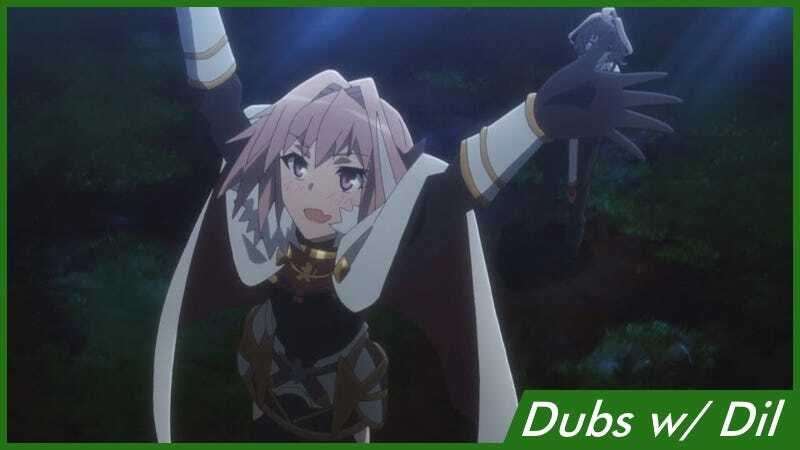 Indeed, Astolfo has the biggest, most rabid fanbase we’ve seen since one of the RE:Zero girls- just ask friend of Dubs w/ Dil, Grex, about his recent encounter with an Astolfo fanboy. I can already feel the angry comments being written right now in regards to this aside, so let us go ahead and continue the analysis. With all of this being said, casting Astolfo comes down to one critical requirement: the voice actor/actress needs to sound just as androgynous as their character looks. Mata is one of the many actresses on the cast I had to do a considerable amount of research on. I’m not familiar with anyone from the Love Live! cast because...well I don’t ever plan on watching that series, and her other significant role was from a series I sold stock in faster than I could hit “sell” after the pilot. Regardless, she gives a voiceover that will fool the best of ears into considering what gender the Rider class hero is. That aside, there is much more to her performance than giving a popular AniMeme a voice. It can be argued that Astolfo gets some of the highest line counts of all of the characters, and a lot of the scenes are emotionally charged. Mata gives that brave head first tone in all of the scenes like one would expect from the character, however she really dials it up for the emotional scenes involving philosophy and matters of life and death. It is almost certain that Astolfo will continue to be a focal point of the second half of the series, and I am looking forward to hearing more from Mata. Another really fun legend being played with in this war is Vlad III- a prince known by many names. Chances are if you know some of the more obscure inspirations the man brought, you are already tracking on some major plot points in the character’s design. Chase gives a far more noble sounding take on someone who was known to feast on the blood of his victims and impale them into wooden stakes by his own hand. There are reasons for this of course, however the character sounds deserving of a crown nonetheless. Often behind the frontlines and strategizing what Team Black (or whatever you want to call them for lack of a better name) will be doing next, there is a ton of the same kind of appeal of listening to intrigue that the audience got from the likes of Crispin Freeman as Kirei Kotomine in Fate/Zero. Talk about going all out for a debut- Clark has her first credited anime voice acting roles in Fate/Apocrypha as not one, not two, but three roles! They aren’t small ones either, with quite a bit of screen time between her Assassin and Archer roles. Reika Rikudou is a character that will have more screen time in the second half of the series, but she made the character sound really creepy (which is exactly what the mood called for). I’m really impressed with how well she was able to spread out the roles, particularly with all three having more than one-liners. Her Assassin role is debatably the biggest one here, and I had no clue that she was the same person monologuing as her and then in the very next scene as Archer. There is actually a stretch in the last act of what is out now where all three characters are focal points of scenes, meaning that Clark is delivering lines for a solid eight or so minutes in the episode. Gutsy directing call, and it pays off well. It is irresistible to give a brief track history of Niosi’s success whenever the voice actor comes up. Blossomed from Internet star status on media website Newgrounds in the 2000s, Niosi has been taking on the torch as the next generation of voice actor alongside other Internet success stories like the voice of NieR: Automata’s 2B, Kira Buckland. Both actors were instrumental in inspiring amateur voice actors and (in Niosi’s case) animators worldwide. With that said, it has been a good last year or so for Niosi, cementing his role as fan favorite Reigen in the smash hit anime Mob Psycho 100. For the role here, Niosi gets a nice one-on-one banter with Chase in a fight between the Lancer class heroes of both teams. It is a fun role that makes me eager to hear Niosi in more roles soon. So if you’ve been following the several series that have been released so far, this one is a bit of a curveball. I made the mistake of looking this one up and ultimately spoiling myself, so believe me when I say “it is complicated and absolutely not what you think”. There is so much weight to this character that would require spoilers to explain, but in my best attempt to avoid any of them, here is what I think: Mittelman is perfect for a role that entails passive speech to move things along, even if the character is deeply rooted into their ideologies internally. No, it isn’t the smooth talking bassy voice that we were spoiled with in the past, but this “fully committed to a goal” version of Shirou is menacing. Kayli Mills (Hina in March comes in like a lion) and Tom Bauer (Shuu in Dragon Ball Super) play the Forvedge Yggdmillennia siblings (Fiore and Caules) and have some really thoughtful moments independently, with one another and with their heroic spirits. Fiore’s spirit, Chiron (Archer of Black) is played by Jalen K. Cassell, another relatively new name in the industry. He has a pretty awesome bit in the middle of a battle with Team Red’s Rider. Caules heroic spirit is Frankenstein (Berserker of Black) played by Sarah Williams (Sayaka Miki in Puella Magi Madoka Magica) and she proves that getting someone to just cry out “Berserker!” might be the best thing ever. If it weren’t for the Astolfo fanboys out there, I’d say that Frankenstein is the go to fan favorite here. Ben Diskin (Joseph Joestar in JoJo’s Bizarre Adventure) plays Darnic Yggdmillennia, who get a nice stretch towards the endgame of this half of the series. Erica Mendez (Atsuko Kagari in Little Witch Academia) gets a duo of roles in her script adaptation dub, Jack the Ripper (Assassin of Black) and Roche Frain Yggdmillennia. The latter fits right in with the “wow these actresses can play young men better and better by the day”, but I’m curious to see how Jack the Ripper plays out in the next cour. Most of her lines in this half were either from the creepy little cut in scenes or from a close call against Saber of Red’s team. Cam Clarke (Shoutarou Kaneda in Akira) plays Avicebron (Caster of Black) and establishes a strong presence for his character. I have to say real quick that it is super awesome that they actually went out and got Lucien Dodge to reprise his role as a much older Waver Velvet. It is almost so subtle that you will miss it, but there is no mistake that it is him. Quick writer’s note: I’m aware I have not covered every voice actor here. Admittedly I had trouble figuring out the specifics on a few of the characters and unfortunately there are no listed credits for them at this time. It isn’t a sleight on them, but I can’t pinpoint every actor by hearing three one-liners (contrary to the popular belief of AniTAYers). There is a lot to be said for how well the group meshes here in Fate/Apocrypha. There are a ton of roles, and furthermore, a ton of newer voice actors filling said roles. Even the direction is done from a rookie in that specific job, so on paper this dub has no business being as successful as it ended up being. Thankfully, there is so much more than what is on paper and this terrific staff flexes some muscle and breaks a tired mold of the “same old, same old” with projects. 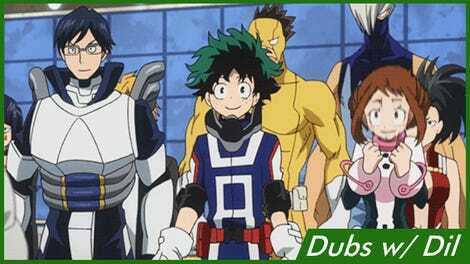 It is a testament to two very critical factors developing in the industry: newer actors are emerging with inspiration from previous anime dubbing (something that the previous group going through the run did not have) and individuals taking up the challenge of directing dubs are established dub voice actors themselves (again, something the previous group could not really say). These trends might still seem coincidental to some, but I can compare it to my other speciality in modern basketball for a better look. A young athlete who grew up on seeing hoops from 1960 will likely play something akin to what the product of 1960 was (while it isn’t crucial to the analogy, I’ll just throw it in here- lots of ground pound and hard nose plays). However, the athletes emerging today have grown up watching players of the late 90s and 00s play, so they fit the model of the new game much better (faster, leaner, and lots of those 3 pointers). Sure, the old way might have worked, but with all of the changes to the game, the overall product would suffer if we didn’t go with young talent that understood how things worked now. Where does it fit in? Coaches up until the mid 10s wanted to hammer in the old, old style of play. If you weren’t jamming the ball down low to the biggest guy on the floor, you were wrong. Then you start to get young coaches who played in the 90s and 00s like Golden State Warriors coach Steve Kerr who get that the only way that we can get the best product is by adapting to the times. All the way back to voice acting, the young talent emerging was raised on the Steve Blum and Wendee Lee roles we all know and love. They eat breathe and sleep what effective voice acting needs to be. Before? Bless a lot of actors’ hearts, but no one really knew what anime dubbing would become in ten or twenty years. In those awful, awful dubs back in the day it was painfully obvious it was just a paycheck. Then we have been started to get blessed with super talented voice directors who have worked behind the booth with editing and even some actors themselves who know exactly how to steer the boat correctly. With all of that said, the real stars of this entire thing have to be Erica Mendez and Erica Lindbeck. To take on a colossal dub like this and fine comb the script to fit very innovative casting and direction speaks so much to what a promising career Mendez has in more than just delivering lines in the booth (and believe me, she has been on fire in that department). As for Lindbeck, it really is no exaggeration to say nearly all of her roles have been home-runs. There is a range she has that is rich with emotion that really makes her an impactful talent that is bound to have a lasting impression on the industry. It is hard to imagine Saber of Red being nearly as entertaining without her tapping into those abilities and bringing the character to life. Who are some of your favorite young voice actors? Thank you so very much for reading Dubs w/ Dil. With the holiday season around the corner, I just wanted to give my thanks for you all and I hope the best for you and your families this season! Per usual, for updates on my writing, anime impressions, and guest appearances on podcasts, be sure to follow my Twitter @DilKokoro.